Shh, there are not seven but eight cities in Delhi. The eighth is the most exciting. It has love, passion, music, poetry, tombs, domes, djinns, hashish, haleem and also biryani. This city of Sufis is totally Islamic but non-Muslims are welcome. With no fixed geography, it is spread all over – from Mehrauli to Turkman, from Kaka Nagar to Karkardooma Mor. It’s identifiable by its dargahs. They’re everywhere. There’s one outside the Jama Masjid; there’s one outside Oberoi Hotel. Around some, entire settlements have sprung up; some lie ignored on roadsides. All have a tomb, a saint, a cult. The djinn is optional. In the pre-dawn hours, the dome at Hazrat Nizamuddin Auliya remains drowned in darkness, yet looks pleasant and restful. Soon the muzzenin will give a call, the beggars will wake up, the khadims will come in, the shrine’s door will open and Hazrat Nizamuddin, Delhi’s 13th century sufi mystic, will again cast a spell of his samaa. This is Delhi’s most touristy dargah and has seen them all – from Jawaharlal Nehru to Rajiv Gandhi, from Preity Zinta to Abhishek Bachchan, from William Dalrymple to Arundhati Roy. Any time is a good time to visit. The main entrance leads to a dark winding alley that skirts an ancient baoli (water-well) before opening into the shrine’s courtyard. The romantics find the air here to be saturated with sad, selfless love. The poet Amir Khusro and the princess Jahanara both loved Nizamuddin; both are buried close to him. Then there are qawwals whose forefathers have been singing here for 750 years. The qawwalis take place daily after the maghreeb prayers, not just on Thursday evenings. While you might not spot djinns here but fakirs are aplenty. Our South Asian Sufis might not be as picturesque as Turkey’s whirling dervishes but they do run around in circles, when possessed by djinns or ganja. Sadly, women are not permitted inside Nizamuddin’s tomb chamber. 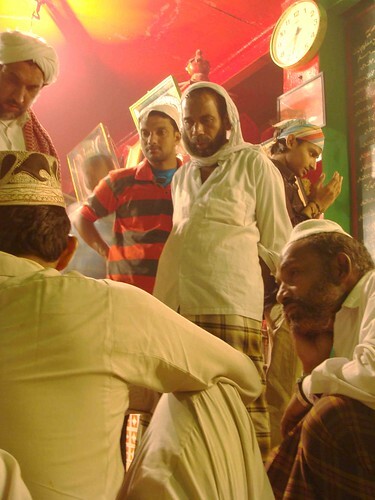 However, a little distance down the road in Kaka Nagar lies a dargah dedicated to a woman – Bibi Fatima. This is an unlikely setting for a shrine – no alleys, slaughterhouses or kebab stalls around. Revamped a few years ago, the dargah looks almost DDA-esque. But appearances are deceptive. The caretaker warned me of in-house djinns! The djinns have a more natural home in the DDA Park opposite Purana Qila on Mathura Road. This garden is wild, with no gate. Trampling through overgrown grass, you climb a hillock where the peak has an open-air dargah canopied with giant neem trees. There are three tombs, all covered with colourful chaadars. The reigning ‘baba’, name unknown, is not as popular as Nizamuddin but devotees come. Apart from prayers, they also fill the special water pots for birds. If you are hungry, hop across the road to Matka Pir’s dargah, famous for its biryani joint. Here, the tree branches are weighed down with clay pots. These are the traditional thanksgiving offerings made to Shaikh Abu Bakr, aka Matka Baba. You may climb the stairs to the dargah or first go to the adjacent stall to have kebabs with rumali rotis. Biryani, however, is served only on advance order. If you are fasting and wish to invoke your God’s name, go to Khwaja Baqi Billah’s shrine in the Sadar Bazaar graveyard. This is a world away from South Delhi dargahs. No qawwals, no khadims, no beggars. Only trees, tombs, dry leaves, occasional pilgrims and crows perched on tombstones. Connaught Place is ten minutes away but that seems unbelievable. More incredible is the twin dargah of Sarmad Shahid and Hare Bhare Shah outside Jama Masjid’s gate no. 2. It is half red, half green – including the door, the walls, the jaalis. Sarmad is red, Hare Bhare is hara. This is a serenity bubble even though Bangladeshi beggars create a racket outside. Sarmad was a naked fakir who had once fell for a Hindu boy. He was later executed by Aurangzeb. However, all that ishq, janoon, and khoon that defined Sarmad’s life seems to have been forgotten within the blood-red walls of his dargah. Which is as it should be. For in Sufism, all the passion is finally dissolved in the love of God. After all, it’s about killing the self. Fanaa. p.s…i enjoyed your Madrid chronicle as well. OMG….”MAS”…..how do you find this places…very very amazed as you uncover the many layers of this mystical city.